Is there a better alternative to Super GHOST? Is Super GHOST really the best app in Language category? Will Super GHOST work good on macOS 10.13.4? Super GHOST needs a rating. Be the first to rate this app and get the discussion started! 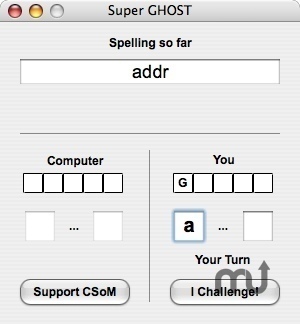 Super GHOST is a computer solitaire version of the age-old game in which you try to add a letter before or after existing letters without making a word; one and two letter words do not count. If you make a word, you get a letter (the first letter is "G"). When you have all five letters ("GHOST"), you lose. In this version, you play against the computer. If the computer cannot add a letter without making a word, it takes a letter immediately. You can "challenge" the computer by clicking on the "I Challenge" button. The computer's word will be displayed and you will take a letter. If you catch the computer bluffing, the computer will take a letter. The Super GHOST word set includes over 80,000 American English words and the user can maintain his own word set using the Word Maintenance window.